This new electronic locomotive controller for analog operation offers the latest technology for high operating current and modern features for your analog operated LGB layout: maximum of 5 amps operating current, suitable for use with any LGB transformer (DC or AC). 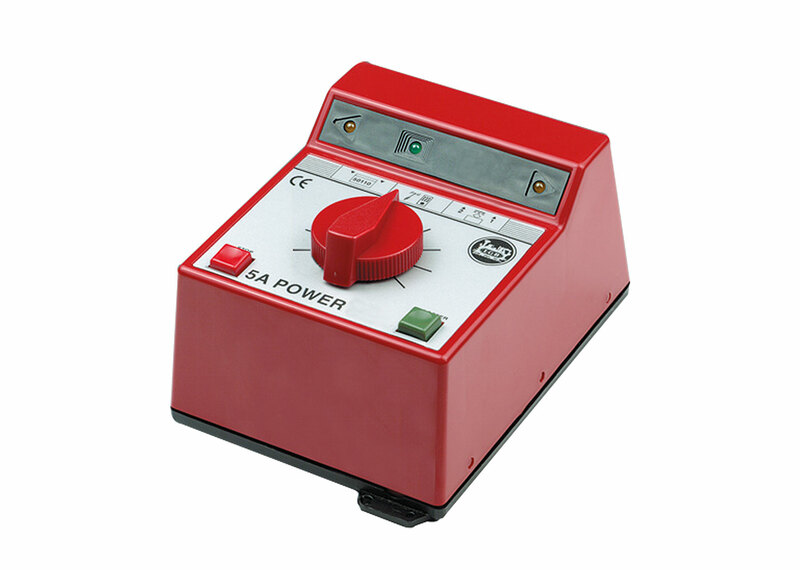 This controller is recommended for use with the 51095 100-watt switched mode power pack. Very fine control and smoothed DC voltage. Naturally, this controller can be converted for radio remote control (with LGB 55050/55055). Adjustable control range: +/- 135° with a zero position in the center / booster button with programmable acceleration, Stop/Halt button. LED indicators for Stop, overload, ready for operation, and direction of travel. Connections for wire up to 1.5 square millimeters in cross section / approximately 15/16 gauge, protected against short circuits. Output: 0-24 volts DC. Operating current: maximum 5 amps. Dimensions 160 x 120 x 95 mm / 6-5/16" x 4-3/4" x 3-3/4". This item replaces item number 51070.